This Journey explores the heritage and historical centers dating back to the significant periods in the history of the Silk Road. Arrive Tashkent 1 Night > Flight & Drive Khiva 1 Night ( Museum ) > Drive Kizil Kum Desert ( Red Sands ) > Drive Bukhara 3 Nights ( Excursion Sitora – I – Mokhikhosa ) > Drive Nurata 1 Night Yurts ( Desert Camp ) > Drive Samarkand 3 Nights ( Excursion Shakhrisabz ) > Drive Tashkent 1 Night & Leave. Upon arrival in Tashkent Airport you are met and transferred to your pre booked Hotel. Afternoon Half day sightseeing tour of Tashkent visiting the old town to see Barak Khana Seminary, Tila Shaikh mosque and archives known for the exhibit of a rare copy of Koran written the third Caliph Othman. Later proceed to Chorsu bazaar, Kukeldash Madrassah (16c). Morning you are transferred to Tashkent Airport to board flight for Urgench. Upon arrival in Urgench Airport you are met and transferred to Khiva. Upon arrival in Khiva check in at your pre booked Hotel. Khiva is the museum under the open sky. In the inner city Ichan Kala no transport, whole day will be just walking tour: Visit Ichan Kala, Kalta Minor, Kunya Ark, Madrassah Rakhimkhon, Mausoleum of Pakhlavan Makhmud. Enjoy view of whole ancient Khiva, Friday mosque and Tashauli Palace/harem.Overnight stay at the Hotel in Khiva. Morning drive to Bukhara via famous Kizil Kum desert (Red sands) See desert flora and fauna: unique saksaul trees and other desert vegetation, different kind mammals. Stop at Amudarya river bank. Picnic lunch en route. Later continue to Bukhara. Upon arrival in Bukhara check in at your pre booked Hotel. Today full day sightseeing tour in Bukhara visiting Lab-i-khauz ensemble, the pool and chaikhana of which is the modern centre of traditional Uzbekistan. A place where the very soul of Central Asia lies mirrored in a piala of steaming green tea. Visit Madrassah Nadirkhon Devanbegi, Khanaga, Mogaki Attari mosque, Poi Kalon minaret and mosque. Later see Madrassahs Aziz Khan and Ulugbek. Afternoon visit Ark Fortress, Balakhauz mosque, mausoleum of Ismail Samanid, Chashma Ayub. Optional Dinner with Folk show at Nodirkhon Divanbegi Medrassah. Today excursion to Sitora-i-Mokhikhosa, the summer residence of the former emir of Bukhara where you can see unique mixture of traditional Russian style of architecture harmoniously mixed with local oriental traditions. Later visit holiest ensemble Bakhauddin Nahshbandi – the burial place of one of Sufic Islam’s founders and holiest saints, Khazreti Mohammed Bakhauddin. Morning drive to Desert of Kizilkum , visit caravansary Rabat-i-Malik. Later Continue to the Mountains Nurata and see the “drawings on the rock” at Sarymysh Gorge. Return to Nurata: Visit Mausoleum Mir Said Bakhorm, pond with holly fish. After lunch drive to the desert camp. Dinner at the camp with delicious food cooked on saksaul tree. Overnight Stay at the Yurts. Morning camel ride. Later Proceed to Aidarkul Lake. Lunch with fresh fried fish from the lake. Later transfer to Samarkand – the Mirror of the World, the Garden of the Soul, the Jewel of Islam, the Pearl of the East. Another name, City of famous Shadows, reveals Samarkand as witness to the full sweep of Central Asia History. Upon arrival in Samarkand check in at your pre booked Hotel. Full day sightseeing in Samarkand visiting Registan Square which was for many centuries the heart of Samarkand. The word “registan” means “a sandy place”, and is derived from the sand left behind after a river running through the region had dried up. See the three beautiful madrassahs: the Ulug-Bek Madrasah built in the fifteenth century; the Tillya-Kori Madrasah built in the seventeenth century; the Sher-Dor Madrasah, also built in the seventeenth century. Visit Gur Emir – another famous point of interest on the tour of Central Asia and of Uzbekistan. The name means “Tomb of the King”, and this is the mausoleum of the Asian conqueror Tamerlane and his descendents. Afternoon see the grandest structure of Amir Temur’s times is the chief Friday Mosque called Bibi-Khanum, the Silk Road bazar and Shahi Zinda necropolis and Silk Road bazaar nearby. Full day excursion to Shakrisabs – the birthplace and home town of Central Asia’s foremost conqueror – the Great Amir Temur. Visit Ak Saroy Palace – the greatest palace, built by Tamerlan, similar in structure to Samarkand’s Bibi Khanum Mosque, but unparalled in size and decoration. The inscription survived only in part, yet the ruined entrance towers stand in monumental testimony to an age of power writ large on tiled canvas. Afternoon visit Dorus Tilavat seminary, Kok Gumbaz mosque, Dorus Saidat and the Friday mosque. Later drive back to Samarkand. 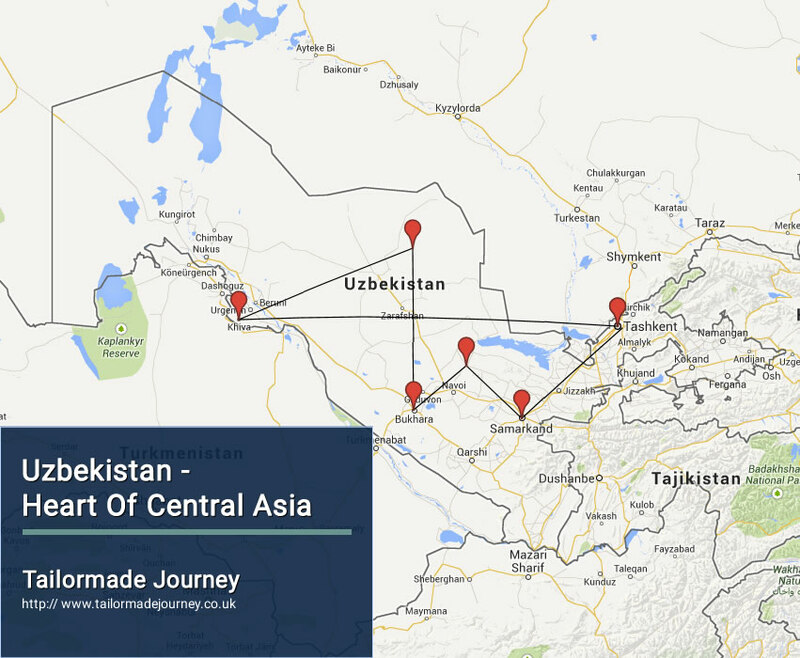 Morning transfer to Tashkent En route see steps and mountain views cross two rivers Zarafshan and Syrdarya. Upon arrival in Tashkent check in at your pre booked Hotel. Afternoon half day sightseeing of Tashkent visiting Mustakillik (Independence) Square in the heart of Tashkent and famous Tashkent Metro (underground) decorated with local marble and granite like an underground palaces, visit Amir Temur squire, Opera Navoi Theatre squire. The yurts are decorated with hand-made carpets and shirdaks (stitched, and often colourful felt floor or wall-covering) of local skilled craftsmen in unusual rich entourage. Woven patterns and even lustres make the pleasure atmosphere. The ecological yurts are very clean; they are made of simple nature materials, such as wood, thick felt and poles, rolled from the fleece. It is cool in summer and warm in winter in the yurt. The construction is always developing. It is easily built and taken apart for one hour. The yurt of one family is removed on two horses or camels. The yurt camp is equipped with a stationary toilets and shower. You can spend the evening by the campfire, songs of the local akyn, admiring the calm atmosphere that is difficult to catch in a noisy city. One can make wishes during the star falling.